The winner of the first PVGA Young Grower Award is Brandon Christner of Dawson in Fayette County. This award is designed to recognize outstanding young growers in the vegetable, potato or berry industries. Brandon grew up on the farm and went to school from a farming community. While his father has always had greenhouses to sell plants that operation only spanned a couple months a year. He asked Brandon if he would be interested in a venture with vegetable production and his eyes light up like the 4th of July. So the research began. That was four years ago and the public in their area is thankful they have decided to start their vegetable operation. Their operation started with 600 tomato plants in the first year and in 2016 they grew 4,000. They also grow a wide range of vegetables and in 2017 plan to expand their potato production to 10,000 lbs. of seed potatoes. Their success has come from both their backs and their brains. His father states that Brandon’s tireless efforts of doing what needs to get done are wordless. Brandon has a determination to be successful. When he is done working at the farm, he goes home and spends his nights doing research for the next crop. His father admires Brandon’s enthusiasm but admits he has to pull back the reins on Brandon sometimes so they don’t get over extended. Brandon has been known to push for trying a new crop before they have mastered their current crop choices. The Christners grow and sell tomatoes, peppers, cucurbits, potatoes, melons, beans cabbage, beets, squash, pumpkins, and Indian corn, as well as pork, poultry meat and eggs. Christner Farms sells at three public farm markets along with a seven-day-a-week market on the farm. They also do a lot of marketing on Facebook and recently became an approved vendor with Giant Eagle supermarkets. 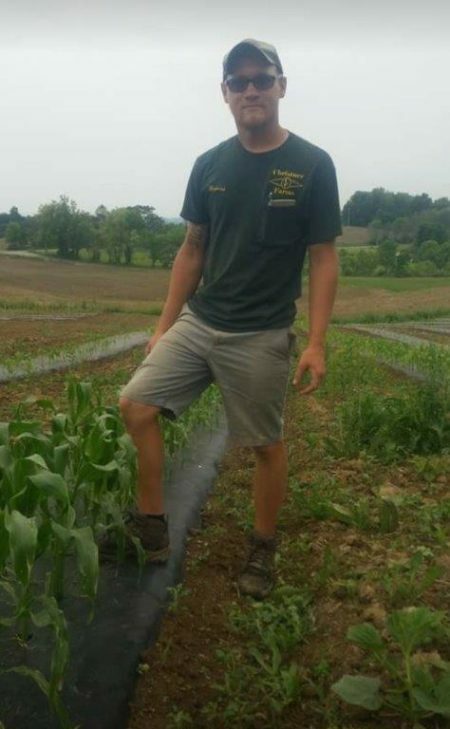 For the last three years Brandon and his father have attended the Mid-Atlantic Fruit and Vegetable Convention which they feel has helped them tremendously. They also planned to attend the FSMA training session in Butler this winter. PVGA Young Grower Award recipients must be PVGA members who are 35 years old or younger, who have been successfully growing vegetables, potatoes or berries for less than five years and who have contributed to advancing or promoting the Pennsylvania vegetable, potato or berry industries. The prize is free registration for the Mid-Atlantic Fruit and Vegetable Convention plus lodging at the Hershey Lodge. To nominate a young grower you think should be recognized (or yourself) send a brief but comprehensive description of the farm operation and the nominee’s qualifications to PVGA at pvga@pvga.org or 815 Middle Road, Richfield, PA 17086, by November 30, 2017.